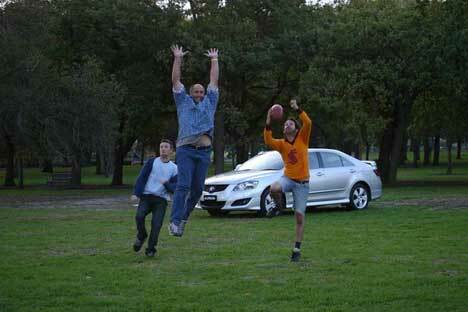 Toyota has just launched the latest in a series of AFL Legendary Moments, this time focusing on Tony Lockett. The ads are hosted at www.toyotaengineroom.com and are all written up here at The Inspiration Room. Lockett is the highest goal scorer in the history of the VFL (Victorian Football League) and AFL (Australian Football League) with 1,360 goals in a career of 281 games that commenced in 1983 with St Kilda Football Club. He has appeared in TV ads for Advanced Hair and Lowes Menswear. In this spot Stephen Curry and Dave Lawson sing a couple of lines from Tony Lockett’s song, “There’s only one Tony Lockett”. They bring on a piglet, a reference to a game in which a member of the crowd released a pig onto the Sydney Cricket Ground with Lockett’s number painted on it. The commentators at that game called out, “There’s a pig at full forward!” The irony was that Lockett wasn’t even there that day, due to injury.There’s a reference to the point Lockett kicked to get the Sydney Swans into the final, as well as the 1300th goal Lockett kicked to get into the record books. See more on Lockett at Wikipedia. The Toyota AFL Legendary Moments campaign is being designed by Publicis Mojo, Melbourne, by creative director Darren Spiller, with creative team Michelle Withers and Subha Naidu and agency producer Sally Davis. Filming was directed by Dogboy (Antony Alekna and Matthew McCaughey) via The Pound, with producer Fiona McGregor.